Chris Hughton hopes Brighton will be a more attractive proposition for potential players this summer after sealing a second season in the Premier League. The Seagulls just completed their first campaign in the top flight of English football since the 1982/83 season and finished 15th. 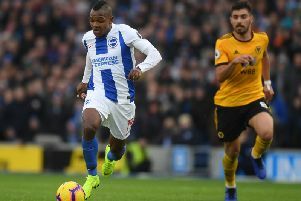 Albion recruited wisely last summer, with player-of-the-season Pascal Gross, Australian number one Mathew Ryan, Dutch international Davy Propper and Colombian winger Jose Izquierdo among those who came in and enjoyed impressive campaigns. Brighton finished seven points clear of third-from-bottom Swansea and the challenge now for the Seagulls is to deliver another consistent season so they can continue to develop and grow in the Premier League. Rumours continue to link Albion with a move for Deportivo forward Florin Andone, who the Seagulls tried to sign last summer and again in January. Andone scored seven times in La Liga last season as Deportivo were relegated from the Spanish top flight for the third time in seven seasons. Hughton has already said the club are likely to do less business than last summer but will look to bring in quality to add to the squad. Asked if the club is now more attractive for potential players after last season, Hughton said: "I hope so. The most important thing for us was to stay in the division and you hope that being in the Premier League for a second season, yes, will make the club a more attractive proposition for others. "We do have a super set-up with the stadium and great facilities, that is a big part of it. "Generally, I think anyone that you are going to bring in will want to come in for the right reasons. That's playing in a team that they think will be a decent enough team and a team they can play in."